OneNote is receiving several updates today across multiple platforms that will make it better for many devices. First up, iOS and Web users can finally add audio recordings to their notes. That means you can easily record meetings or lectures, and add the clips directly to documents. Web users can also now add other sorts of attachments too, such as a PowerPoint slide from a coworker or professor. On the desktop you can now embed Web video from sources like YouTube and Vimeo with a new video button. It’s something that probably should have been there a long time ago given the plethora of educational YouTube videos. Students will find the feature handy. 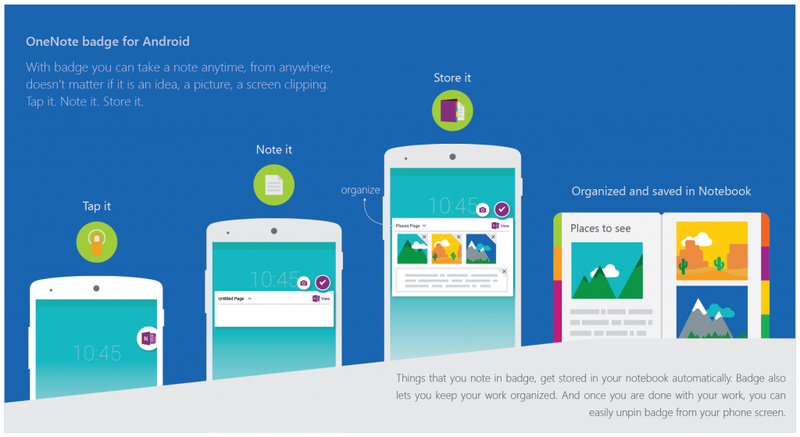 Android users get perhaps the most useful update: the OneNote badge. Similar to Facebook Messenger’s ‘chat heads’ on Android, the badge can remain on your screen in any app and allow you to quickly jot down notes while browsing the web or watching a video. It means you don’t have to constantly be moving between apps, giving you something akin to the functionality Samsung provides on the Galaxy Note 5, except with all of OneNotes’ tools behind it. You can launch it simply by pulling down your notification tray and tapping the persistent OneNote badge notification. Notes are saved into your Quick Notes section, but you can adjust the save location in the app’s settings. As with Facebook Messenger, you can dismiss the badge by pulling it to the bottom of your screen. One more tidbit for iPhone users: 3D Touch. You can now use a stronger press on the OneNote icon on your home screen to pull up a menu that allows you to directly create a new note, take a new photo or view recent notes. The updates for Android, iOS, and Windows are rolling out today, but the Android badge may take up to 2 or 3 weeks to be available on your device.